Collections of the Draper Natural History Museum are used for public education, exhibits, and research. Our collection documents the natural history of the Greater Yellowstone Ecosystem and the relationship between humans and nature. Our scientific specimens are primarily study skins and skeletal material representing the classes Aves and Mammalia. Within Aves, Accipitridae, Falconidae, and Strigidae are particularly well-represented. 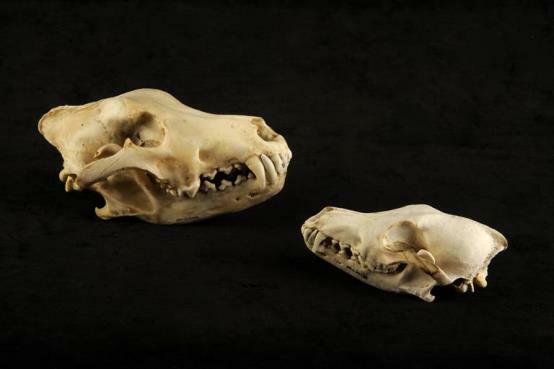 Within Mammalia, skulls of Canidae and Ursidae are well-represented, especially skulls and post cranial skeletons of gray wolves (Canis lupus) from the Greater Yellowstone Ecosystem. Please feel free to visit our online collections. If you would like to request more information or to schedule an appointment to view the collection please e-mail Corey Anco. Gray wolf and coyote skull from the Draper Natural History Museum collections. 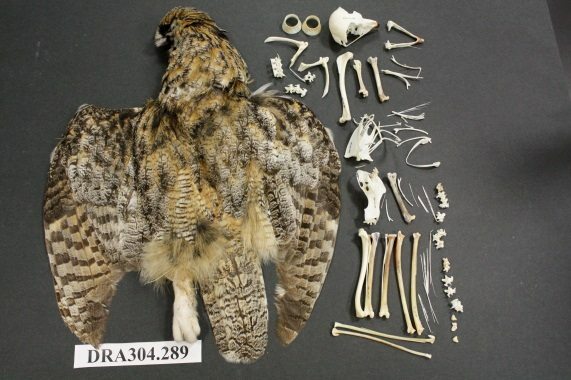 Great horned owl and skeleton from the Draper Natural History Museum collections. Penny Preston volunteers numerous hours ensuring the Greater Yellowstone Sights and Sounds logs are perfect. The Greater Yellowstone Sights and Sounds Archive (GYSSA) is a digital collection of photographs, videos, and sound recordings of life in the Greater Yellowstone Ecosystem. Development of the GYSSA is supported in part by the R.K. Mellon Family Foundation. 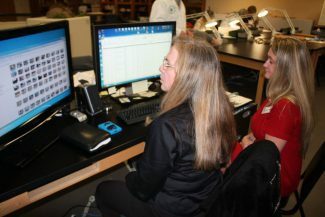 The archive features wildlife and landscapes, as well as interviews with individuals connected with important conservation issues in the region. Please check out the online archive and if you would like to request information about our holdings, please e-mail Corey Anco. This taxidermy-mount of a bull moose can be seen in the Mountain Meadow environment along the Alpine-to-Plains trail. 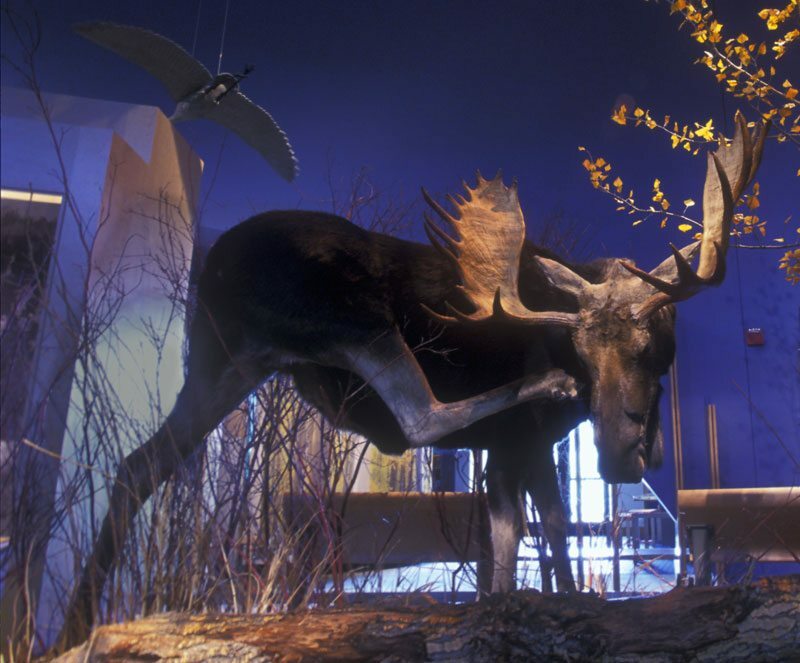 Our collections include taxidermy mounts, skins, skeletal material, paleontological and geological specimens, and still and moving images for use in our gallery exhibits and in interpretive programs. Many of these are on display in our Greater Yellowstone Adventure exhibit galleries. For additional information, please e-mail Corey Anco.